Staples' Tia Zajec plays the ball upfield during a 4-1 win over Darien on Friday. 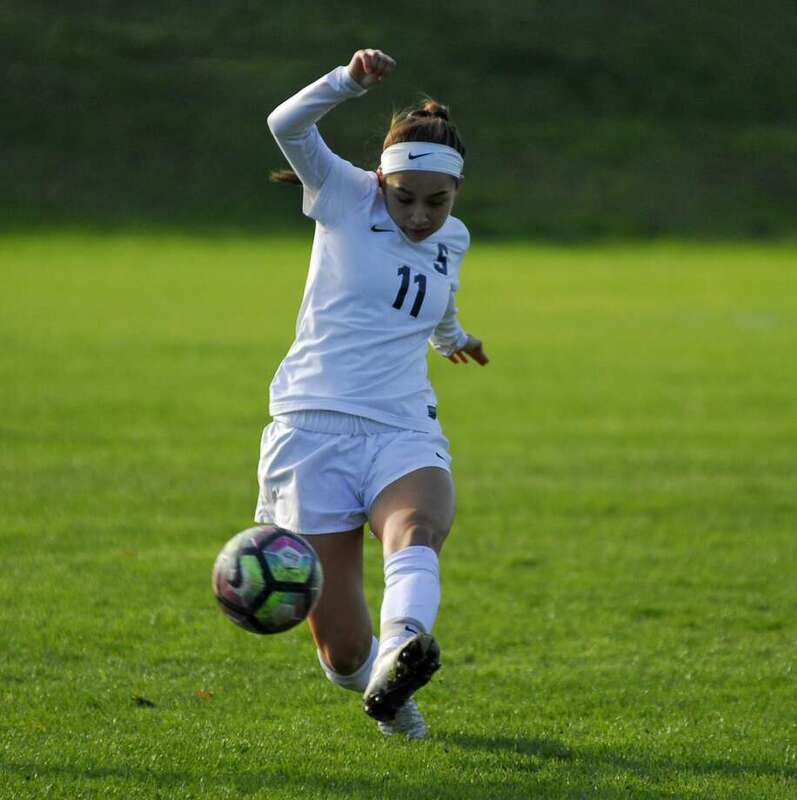 WESTPORT—Considering the Darien girls soccer team had only given up seven goals all season prior to Friday’s FCIAC quarterfinals, Staples coach Barry Beattie knew that the first goal in the matchup between the two teams would go a long way in deciding the winner. The Wreckers jumped on the visitors with a goal inside six minutes, and didn’t let up the pressure in scoring the first three of the match. In delivering one of its finest performances of the season, No. 2 Staples brushed aside Darien 4-1 and will take on No. 2 Ridgefield in the semifinals Tuesday at 7 p.m. at Wilton High School. Ashley Wright and Reese Sutter each scored twice for the Wreckers (12-2-3), who kept their hopes of a second FCIAC title in three seasons alive. "To get (the first goal) was huge. They’re a good team and for us to score four in a game sends out a good statement," Beattie said. "It’s very impressive for us to come away with a 4-1 win; we’re building some momentum and confidence." Led by midfielders Tia Zajec and Sutter, the Wreckers were able to control the game from midfield and create numerous offensive opportunities. "We really focused on (Darien’s) two fast forwards (Katie Ramsay and Emma Lesko)," said Zajec. "Once we start passing around, eventually we’ll get goals and that’s what we did." The Blue Wave — which fell 2-0 to Staples during the regular season — had their FCIAC season end at 9-4-4 and will have time off before the Class LL tournament begins. The Wreckers had nine corner kicks in the game and turned two of the first into goals—in completely different ways. Wright got a foot to the ball at the end of a scramble early in the match to give Staples a 1-0 lead. Sutter then turned up the creativity and curled a corner right into the corner of the Darien goal. The hosts made it 3-0 early in the second half as Wright converted a pass from Catherine Sprouls. That tally finally woke up Blue Wave, who began to turn on the pressure. Staples goalie Anna Sivinski was a spectator for the first half, but was called upon multiple times in the second. She first had to make a stop from Darien’s Riley Allen who was all alone in front, then she watched as teammate Olivia Ronca cleared the ball off the line from a hard shot from a Blue Wave player. Darien’s pressing finally paid off as Emma Lesko nicked home a ball from a free kick with 16:48 to play. The spell appeared to signal the Blue Wave were about to stage a comeback, but Staples had another response. The Wreckers wrapped up the win and a place in the final four soon after when Sutter smashed a shot that went off the hands of Blue Wave goalie Christine Fiore and into the back of the net. Staples fell 2-1 at Ridgefield early the regular season and is eagerly looking forward to the rematch on Tuesday. "We have to come as strong as we can and do what we did here," Zajec said. "Even though we don’t have home field advantage and we’ll be on turf I think we can do it." Records: Darien 9-4-4; Staples 12-2-3. Goals: D—Emma Lesko; S—Ashley Wright 2, Reese Sutter 2. Assists: S—Cat Sprouls. Goalies: D—Christine Fiore (7 saves); S —Anna Sivinski (5).